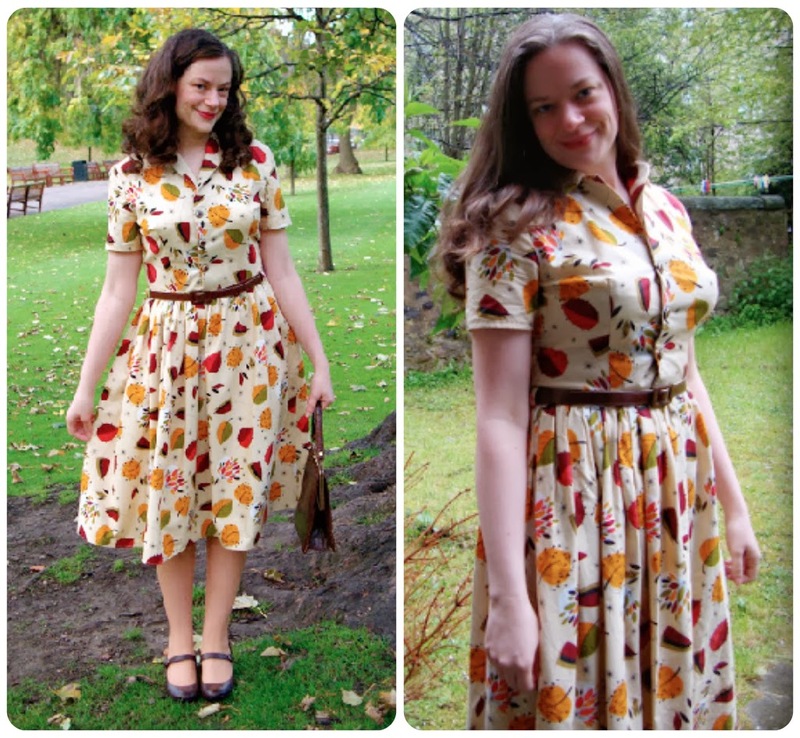 Today's post is all about vintage-inspired brassieres! Each decade has had it's particular silhouette, and nothing completes a vintage outfit more than the right foundation wear. As you all know, I love sewing vintage patterns and have sewn items spanning many different decades. One thing I have noticed is that the patterns fit much better with the appropriate foundation wear, including brassieres. Of course, you can make slight alterations on the pattern (I'm thinking specifically about bust darts here) to change the look of the garment to suit more modern foundation garments. I know a lot of people do this, but for me one of the reasons I love sewing vintage patterns is specifically for the vintage silhouette it creates!! The three decades I sew the most patterns from are the 1930s, 1940s and the 1950s. In the left photo I am wearing the Harlow bullet bra and in the right photo I am wearing a regular modern fit bra. It's amazing how the silhouette changes. I only really feel comfortable wearing the bullet bra under 1950s dresses and I'm not so comfortable wearing it under sweaters or tight-fitting garments. It is quite a 'pointy' look. It helps having a very busy print to distract from that aspect! I have to say that I always wear my vintage-inspired lingerie underneath a camisole or slip. A fabulous post by Mrs Depew about what vintage bra patterns are worth and a fabulous compendium of vintage lingerie patterns! What about you? 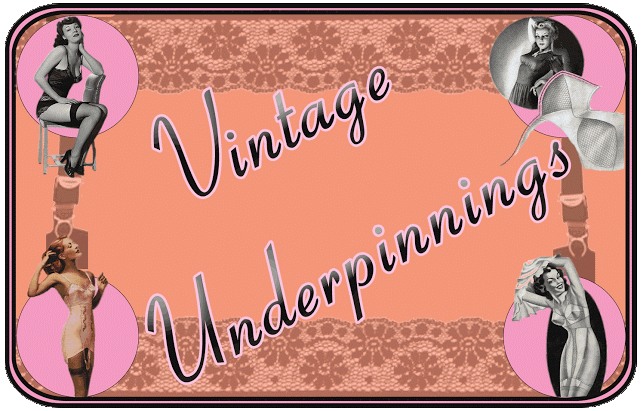 Have you sewn any vintage-inspired lingerie? I've been thinking about buying one of the vintage style bras from What Katie did for ages… I just don't really dare to risk buying online because I'm not sure about the sizing. I have dabbled in regular, present day, bra making and my successful one, a strapless bra with additional boning supporting the lower cup, surprised me by providing a rather 'vintage' silhouette. I should really make more bras like that one. I have added into my sewing queue several vintage patterns, not sure when I will complete them. One is a long line strapless bullet bra reproduction pattern. I also followed along with the Va Voom Vintage sew aalong but had fitting issues so I have added it to my UFO pile. I was starting to wonder about the pointy look and if it would look ridiculous. I think I will finish it and pair it with a silp under my shirtwaist dress. I have some foundation patterns waiting for me too but I think I will start with something less intimidating (for me) than a bra - maybe a slip :) I can't believe the difference the bullet bra makes! And I totally agree with the choice of a busy print! Wonderful blog like always! This is such a great list and I love how you compare the clothing with different types of foundation garments. I never would have imagined they would have made that much of a difference, though of course it makes perfect sense. I'm very interested in sewing vintage foundation garments and the closest I've come is sewing from Ohh Lulu's vintage inspired line. I do really love her patterns and the bras I make are the most comfortable foundation pieces I own. I aspire to make foundation garments from the 20s, 40s, maybe even a bullet bra as well, and some slips. I've been lacking for too long! Thanks Kristin! I'm hoping to sew up a pattern from one of Ohh Lulu's line as well. Which ones did you sew? Thanks dear!! Yes--I'm hoping to start with a slip as well!! I love that Brittany did the Va Voom Vintage sewalong….I forgot to mention that I sometimes also use the bullet bra pads that places like 'What Katie Did' sell…they are helpful for avoiding the wrinkled look! Happy Sewing! It is tricky buying online because of the sizing!! I think I did return my original bullet bra because it didn't fit…but I can't remember. Plus, there's no elastic or anything--so it's a proper sturdy fit--so you'll want to get it right. Wow--I am super impressed with your lingerie sewing experience!! Was the process of sewing up the bra fairly easy? I bought a Bali Flower bra, since I couldn't quite afford any What Katie Did bras at the moment. It gives a nice, 40s type silhouette and I was pleased to find it in my size (32B) since many bras with a more vintage look seem to only come in larger sizes. I'd recommend it as a nice, affordable option. You should! I've made both the Jasmine and Ginger bras and I recommend them both. The Ginger has more of a classic shape to it whereas the Jasmine is more like a bralette. Sewing lingerie takes some getting used to - and a sewing machine which can handle lycra well. Doing elastic edges properly can be a bit of a learning curve but usually, the big problem when making a bra is not with the sewing but with the fitting. Because you are using stretch and non-stretch bits and because of how a bra is worn, you can only really see how it fits when the bra (just about) finished. There are a lot of fitting issues and/or mistakes which you just can't see before then. And getting the right materials can be difficult as well. Not just finding them (which in the UK, like in the Netherlands, shouldn't be too much of a problem) but getting the right size and shape of underwire can be a struggle. Of course, I have been drafting my own lingerie patterns which may have made everything more difficult than it had to be. Hi Debi, this is such a great resource! Thanks for linking to my pattern, too. 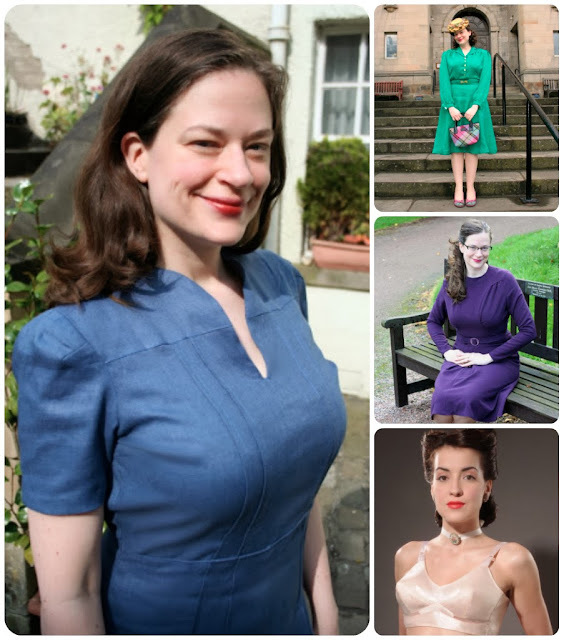 I just love sewing my own vintage style lingerie, though it can take a lot of hunting for the right pattern that doesn't make my small chest look like a pair of kitchen funnels under a dress! I love this shirt dress you made. Gorgeous!